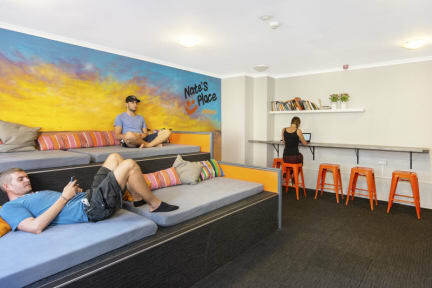 Nate's Place Backpackers i Sydney, Australien: Reservér nu! Nate’s Place Backpackers offers affordable accommodation and is just a short walk to Kings Cross Station. We are perfectly situated in between the bustling Kings Cross nightlife district and the central city so you can explore all Sydney has to offer with ease. And if you feel like relaxing you are only a short walk away from Hyde Park where you can sit down and listen to the daily buskers. Just two train stops or a short walk away you’ll find Westfield Tower and shopping centre, Darling Harbour, Hyde Park and an array of other city attractions. Two stops in the other direction, you’ll find the world famous Bondi Beach and beautiful coastal walks. And if you don’t feel like going that far you’ll find a tasty selection of bars and clubs right on your doorstep. Free unlimited WiFi Internet is available around the clock and we offer a free continental breakfast every morning with tea and coffee available all day. 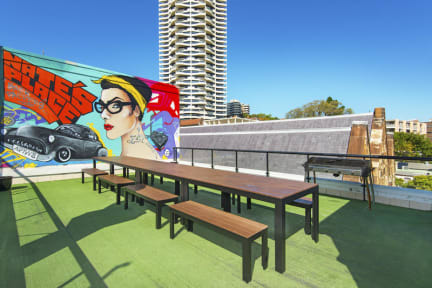 We also have an amazing rooftop with scenic views of the city (including the iconic Sydney Harbour Bridge) which is perfect for chilling with friends, having a twilight dinner or even a couple of drinks! We have a fully equipped kitchen, separate male and female bathrooms with plenty of showers (so you’re never waiting around), washers and dryers for all those travel-worn clothes and chilled TV room with Foxtel (over 100 channels!) for when you just fancy relaxing.